Good software for watching videos on Mac? I want to watch videos on my Mac but I don't like QuickTime. I was wondering what the community recommends. In particular, I was interested in some granular ability to slow down the video or speed it up. It seems that QuickTime can only double the speed. I wish I could, for example, say, increase speed to 1.5 or 1.25 (like YouTube). Sometimes I end up just uploading it to YouTube and watching it there - which is, I think, a little dumb. Also, if it has any additional ability to rotate videos and save them, or concatenate two videos together and save the result; that would definitely be a plus, though not a requirement. This answer will be short: VLC. Has everything you need except the rotation. It's a media player, not a video editor. To alter the playback speed in VLC: Go to to Playback → Playback Speed. You can also alter the playback speed using ⌘= and ⌘-. For rotation, as user Iwillnotexist Idonotexist notes in the comments below, you can go to Window -> Video Effects → Geometry → Transform. 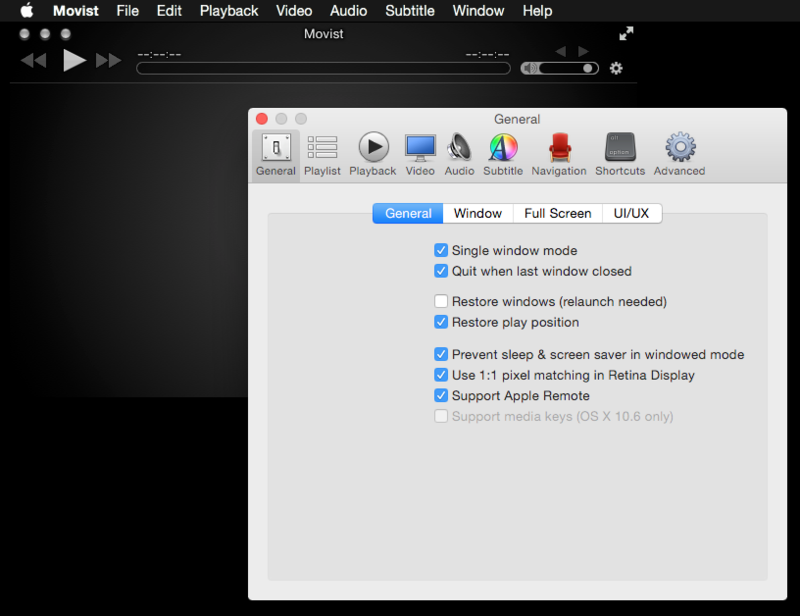 Bonus: A list of some VLC keyboard shortcuts for OS X.
I prefer the interface to VLC, it feels more OS X integrated to me. Also I use skip forward or back a lot and that seems to be better than VLC's version of it. I use Movist. It's a native video player that used to be free but is now sold at the App Store. Old versions can still be downloaded for free, but they use an old version of ffmpeg that doesn't even support Hi10P, and the application has changed a lot since then. Both Movist and MPlayerX have nicer UIs than VLC in my opinion, and they are also faster at seeking and at opening files. Both Movist and MPlayerX also support restoring the playback position but VLC doesn't. Movist is a bit more customizable than MPlayerX though: it supports for example centering subtitles vertically and using a custom implementation for full screen windows. I recommend IINA - The modern video player for macOS. It's Open source, supports URL streaming, Picture-in-Picture mode and other features. Not the answer you're looking for? Browse other questions tagged software-recommendation video quicktime youtube .